What’s for dinner? Chinese long bean stir fry with Enokitake mushrooms, water chestnuts and brown short grain rice. 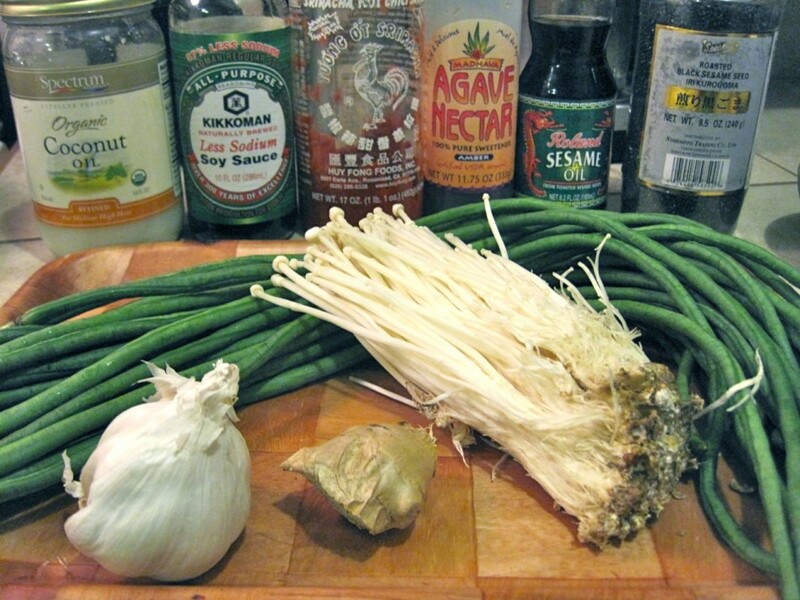 Pictured above is a photographic gathering of ingredients: Chinese snake beans cut into 3 inch pieces (substitute with string beans if you can’t procure this ingredient locally), Enokitake mushrooms, water chestnuts (not pictured), chopped garlic, chopped ginger, coconut oil, sesame oil, low sodium soy sauce, agave nectar (or honey), Sriracha and black sesame seeds (optional). 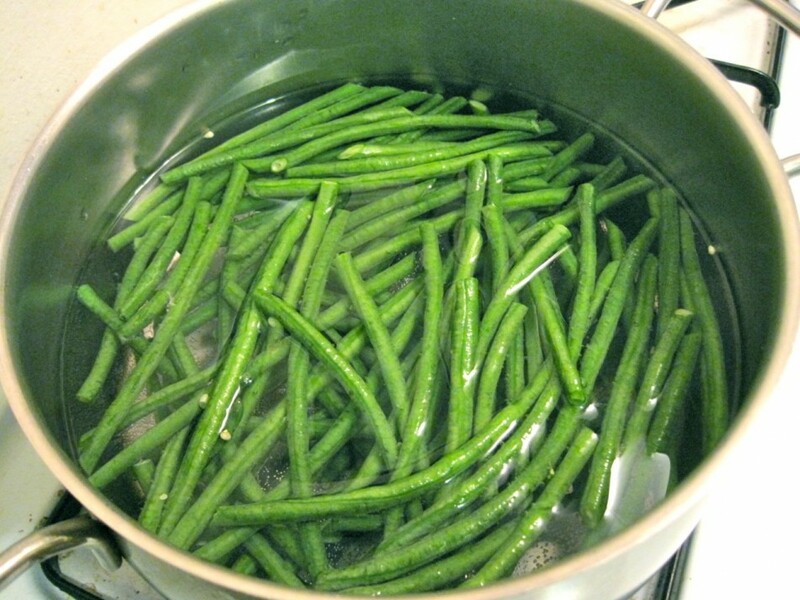 Because long beans often take a little longer to cook than regular string beans, it is best to blanch the beans for about 3 minutes first (instructions here). If all your ingredients are prepared and ready to go, there is no need to drop into icy cold water, simply pat dry and move on to the next step. Add a tablespoon of coconut oil to the hot wok. When heated add beans and toss for a couple of minutes. 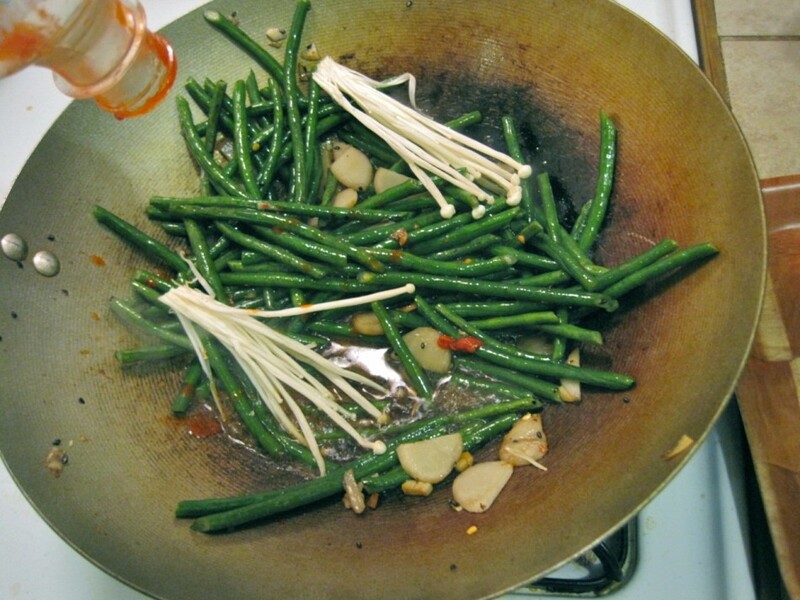 Sprinkle in some sesame seeds and the water chestnuts and continue to toss together, frying in the wok. After about a minute and a half add the fresh chopped garlic and ginger, toss for another minute. After the vegetables seem nice and almost cooked, it is time to make the sauce. Splash in about 1/4 cup of water, a couple tablespoons (or splashes) of soy sauce, a splash of sesame oil, two tablespoons (more or less) of agave nectar, Sriracha sauce to taste… mix well, toss in the mushrooms, cover for about a minute to steam and serve over brown rice. 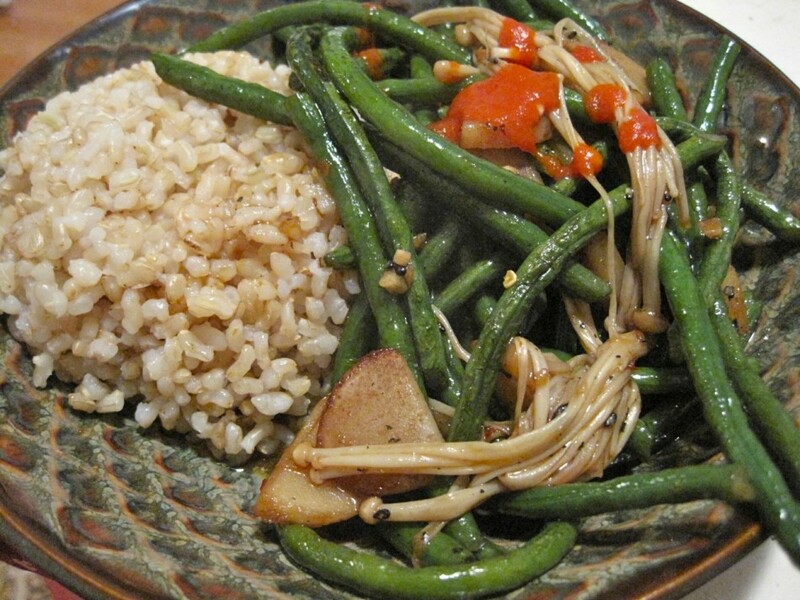 March 10, 2011 | Filed under dinner, gluten free, lunch, vegan, vegetarian and tagged with asian, snake beans, stir fry, vegan, vegetarian, veggies.